When it comes to the Syrian insurgency, one of the biggest dilemmas facing its backers has been the role of al-Qaeda affiliate Jabhat al-Nusra. Despite its affiliations, the group has been widely viewed by the insurgency as an important military partner in many (but by no means all) of the zones of conflict since it first came on the scene publicly in 2012. Jabhat al-Nusra's fortunes have varied over time- for instance, it lost all of its assets in the oil-rich eastern province of Deir az-Zor to the Islamic State by summer 2014- but it has survived notions of a total collapse. Today, its main base is in the northwestern province of Idlib, and with the breakdown of the U.S.-Russia brokered 'cessation of hostilities' this year, Jabhat al-Nusra has played a leading role in fighting in Latakia and south Aleppo countryside, spearheading alongside Salafi group Ahrar al-Sham the coalition known as Jaysh al-Fatah, which was first set up in 2015 and led the routing of the Assad regime from Idlib province. Previous attempts have been made by the insurgency's main foreign backers- particularly Qatar, which has mediated in hostage crises- to persuade Jabhat al-Nusra to break ties with al-Qaeda, but so far they have all been rebuffed, with leader Abu Muhammad al-Jowlani remaining a steadfast loyalist to al-Qaeda leader Ayman al-Zawahiri. This should not be surprising, as Jowlani owes his survival as the group leader to Zawahiri's mediation in his favour in 2013 when Islamic State leader Abu Bakr al-Baghdadi, who helped set up Jabhat al-Nusra, tried to subsume Jowlani and the group when he unilaterally announced the expansion of what was then Islamic State of Iraq into Syria to become the Islamic State in Iraq and al-Sham. 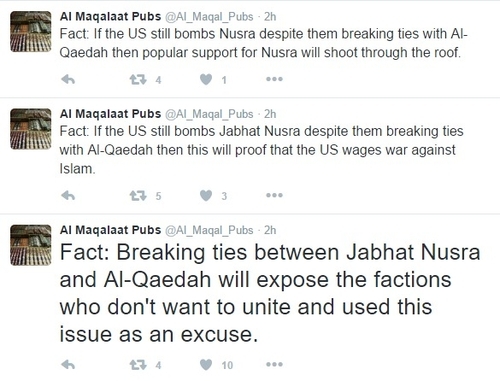 The latest talk of Jabhat al-Nusra breaking ties with al-Qaeda seems to be somewhat more intense this time. Though the move might be ostensibly welcomed and supported by foreign backers of the insurgency, it may actually reflect an al-Qaeda endorsed strategy of embedding Jabhat al-Nusra more deeply in the Syrian insurgency while preserving the long-term commitment to establishing an Islamic emirate in Syria as one of many stepping-stones to reviving the Caliphate. In origin, the latest round of discussions surrounding this issue partly comes from Jabhat al-Nusra dissenters who subsequently fell-out with the main leadership, such as Abu Mariyah al-Qahtani and Saleh al-Hamawi, who, it must be emphasized, do not disagree with the eventual goals but believe that at times the group has not been pragmatic enough on the ground, despite Jabhat al-Nusra's more general reputation for pragmatism in comparison with the hardline approach of the Islamic State towards rival groups. The name of Qahtani, who has also long been critical of obsessions with banners and group identity and warned against ghuluw ('extremism'), came up earlier this month in the founding statement (see below) of a new group of jihadi scholars in Syria called 'Tajammu Ahl al-'Ilm bish-Sham' (Assembly of Al-Sham Scholars), alongside Saudi-born Abdullah al-Muheisseni, who is a leading cleric in the Jaysh al-Fatah coalition. Other context issues to consider include the recent U.S.-Russian talks of a coordinated bombing campaign to target Jabhat al-Nusra in return for Russia not striking U.S.-backed rebel groups and putting pressure on the Assad regime to ground airstrikes, and further back in the past, Ayman al-Zawahiri's speech released in May 2016 entitled "Go forth to al-Sham," which stressed the importance for the 'mujahideen' in Syria to unite, and that "if they [the people of Syria, at the heart of whom are the mujahideen] establish their Muslim government, and choose for themselves an Imam, then what they choose is what we choose. For we, by God's grace, are not seeking authority, but the rule of the Shari'a, and we do not wish to rule the Muslims, but rather we wish to be ruled as Muslims in Islam." Zawahiri thus emphasized that the long-term project, which should establish an Islamic government, 'liberate' al-Aqsa and revive the Caliphate, was more important than the notion of group affiliation, even as he made clear that he did not believe external powers would necessarily be content with Jabhat al-Nusra breaking ties with al-Qaeda, but rather they would then strive to make the group play along with their agendas and dispose of it when convenient. With so many senior al-Qaeda members having come to Syria, it is clear al-Qaeda views the area as the best hope for realizing the first steps in its project (which, contrary to popular assumption, does not simply mean a base to strike the West, but also the establishment of governance). As with any developing story, particularly involving networks in a country where few independent reporters can provide updates, there is much fog of confusion along with rumour as to what are the exact terms being proposed for a Jabhat al-Nusra break with al-Qaeda. One line of suggestion is that there is a quid pro quo deal being put to the table whereby Jabhat al-Nusra drops the al-Qaeda affiliation in return for the formation of a larger coalition body with other insurgent factions. One jihadi outlet reporting from Syria- known as al-Fustaat- had the following to say on the matter in the early hours of 25 July local time in Syria. 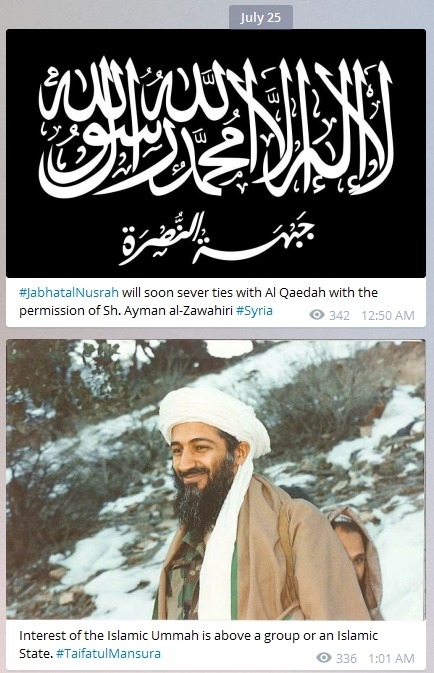 Al-Fustaat claims that Jabhat al-Nusra will soon break ties with Zawahiri's permission. A similar outlet, al-Maqalaat, elaborates on the implied reasoning, in that since Syrian opposition and insurgent factions have long called on Jabhat al-Nusra to break ties with al-Qaeda, Jabhat al-Nusra is effectively putting the ball in their court to come together, and thus those who still refuse to unite will be shown as disagreeing with the ideological program, not merely the name affiliation. In addition, the outlet asserts implications for U.S. policy in that if Jabhat al-Nusra is bombed despite the breaking of ties with al-Qaeda, then popular support will only massively increase for Jabhat al-Nusra. While we will simply have to wait and see what the final outcome is (e.g. perhaps all these negotiations break down, with no real changes on the ground as a result) and it is possible these sources are putting an 'anti-fitna' face to serious internal disagreements within Jabhat al-Nusra, the prospect of a formal breaking of ties with al-Qaeda and formation of a new coalition body with al-Qaeda's blessing arguably represents the worst outcome from the U.S. perspective, making targeting of terrorist figures much more difficult as they will be ever more deeply embedded in the wider insurgency. Further, in such a scenario, if the proposed U.S.-Russia coordination actually goes forward, it seems likely that a larger coalition between Jabhat al-Nusra and other groups would then quickly and easily dismantle many of the U.S.-backed groups among the Syrian rebels in the north, reducing any influence and leverage in so far as U.S. policy hopes for an eventual political transition in Syria. Or perhaps U.S.-backed groups would join this coalition. A somewhat better scenario (if there is 'anti-fitna' whitewashing in the above sources) will see a severe fragmenting of Jabhat al-Nusra as a result of the negotiations, whereby many rank-and-file members perhaps less keen on the affiliation and ideology break off from Jabhat al-Nusra and join other groups while the leadership and other known al-Qaeda members who have come from abroad remain as they are in loyalty to al-Qaeda, more easily distinguishable from the wider insurgency. Jabhat al-Nusra has effectively exploited the breakdown of the 'cessation of hostilities': it may well outsmart the U.S. further with the supposed breaking of ties with al-Qaeda, which, far from reflecting a change in the ideological end goals, could actually embody an al-Qaeda ideal of integrating more deeply into the local environment.